The T-38 Talon is a twin-engine, high-altitude, supersonic jet trainer used in a variety of roles because of its design, economy of operations, ease of maintenance, high performance and exceptional safety record. It is used primarily by Air Education and Training Command for undergraduate pilot and pilot instructor training. Air Combat Command, Air Mobility Command and the National Aeronautics and Space Administration also use the T-38 in various roles. 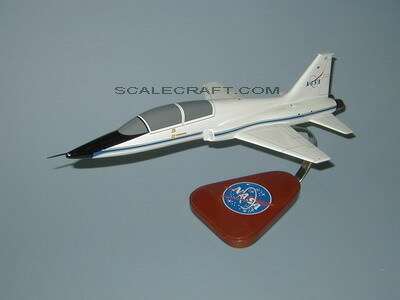 NASA uses the T-38 as a trainer for Space Shuttle crews. Mahogany wood. Wingspan 9 1/2 inches, Length 18 inches.